My little brother turned 30. We came. We partied. 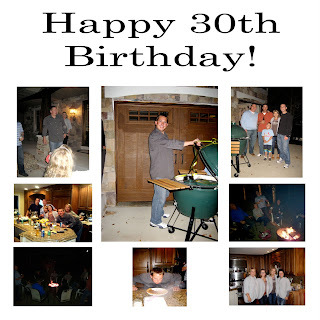 We got him a gigantic Big Green Egg that weighs 800 pounds with no real plan on how to get it to his house. Happy Birthday Jeffrey! Hope you got your Egg home! It was a good Friday night. Saturday morning we went to Jack-a-roo's last soccer game. They won, I think Jack scored all 4 goals. Way to go Jack! We then stopped by Gram's for a quick visit. We rejoined my family for lunch. The kids watched Spiderman in the kid's room. Vaughn hasn't stopped talking about Spidey since. Back home, we found the piece for our broken treadmill had been delivered. Justin fixed it and we're back up and running. Literally. On Sunday we took 2 car loads of stuff to Goodwill. The extra elbow room feels great. Big week of Halloween related stuff going on. Can't wait! Hope everyone had a great weekend! damn my shoes look good!